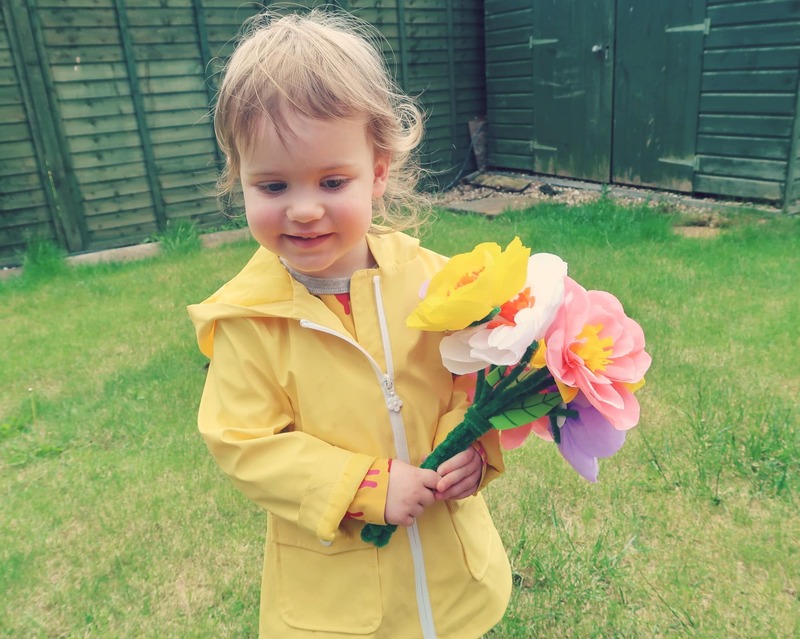 Littlest loves flowers. Whenever we have any in the house she is always asking to be lifted up to touch them. It can be a little dangerous though, as fresh flowers are usually in glass vases full of water. In addition, it is not always practical or sensible to let a two year-old play with an expensive bouquet. 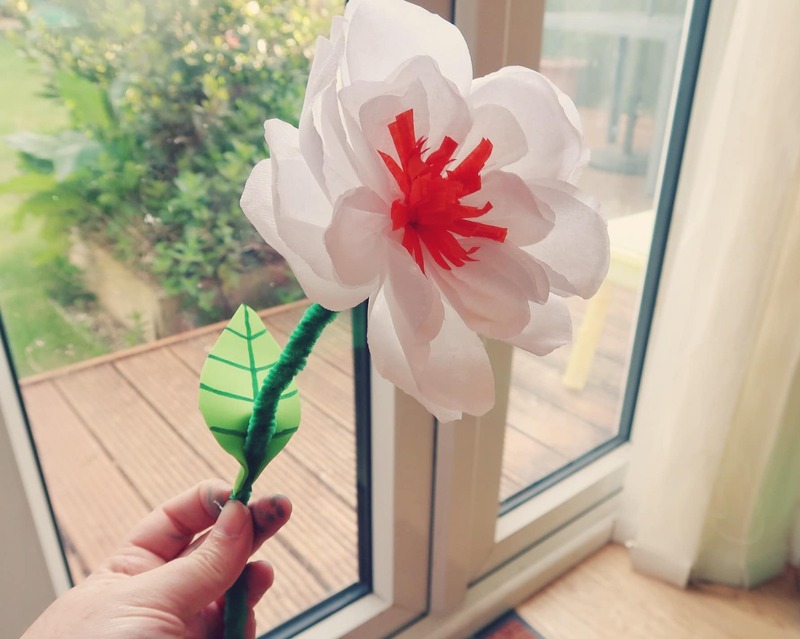 So, as this month’s Bostik Blogger theme is flowers, I decided to create some paper flowers for Littlest to admire and use for imaginary play. 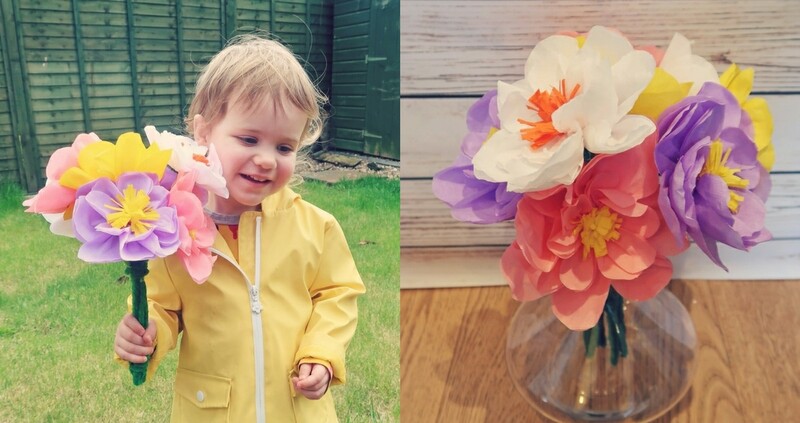 These paper flowers would work perfectly in a play house or as part of a dressing-up costume or imaginary play. Littlest absolutely loves them and has been carrying them around with her since I made them! I adapted this method for paper flowers from this fabulous Giant Paper Flower for a DIY Wedding Backdrop Tutorial from Smile Mercentile Craft Company. I did have to change a few key things, as the flowers I made were much smaller, but the basic principle is the same. 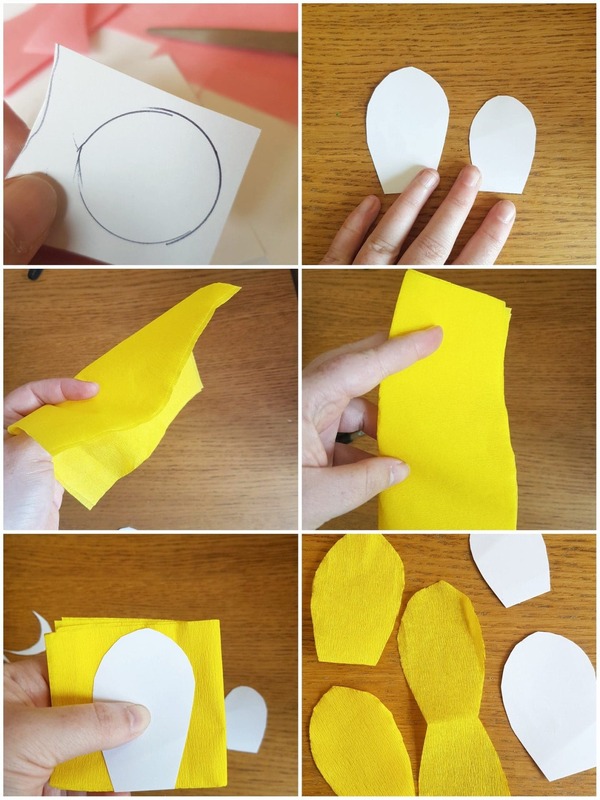 1.Cut out a petal shape with the fold at the bottom. You should then have shapes which look like an hour-glass when unfolded and there should be 8 of each size, 16 in total for each flower. 2. Then, fold the petal at the base, into a concertina-style shape and pinch to crease it. Release the petal and then glue the base and re-gather so that it is gathered into a point. 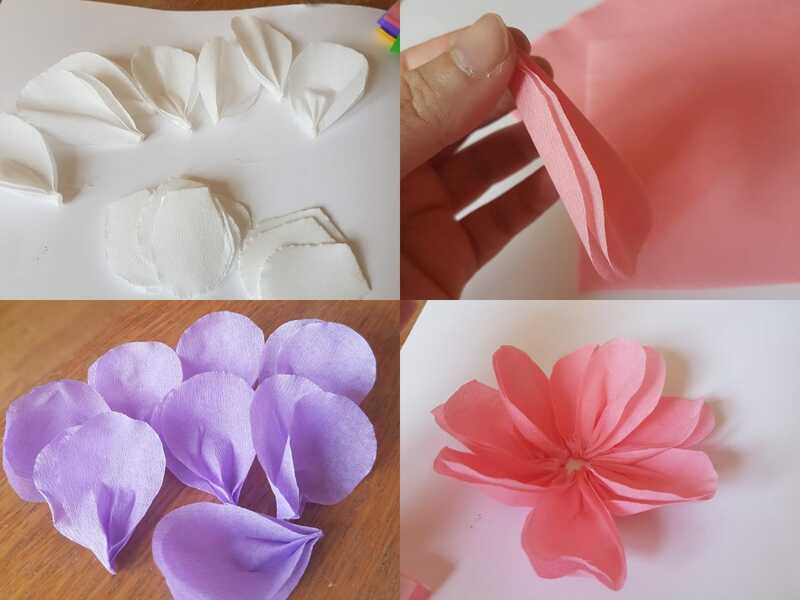 3.Next, stretch the middle of each petal, so that the crepe paper forms a more natural petal shape and then glue them to your card circle, leaving a small hole in the middle. Add each new petal so that it overlaps the last one slightly. 4. 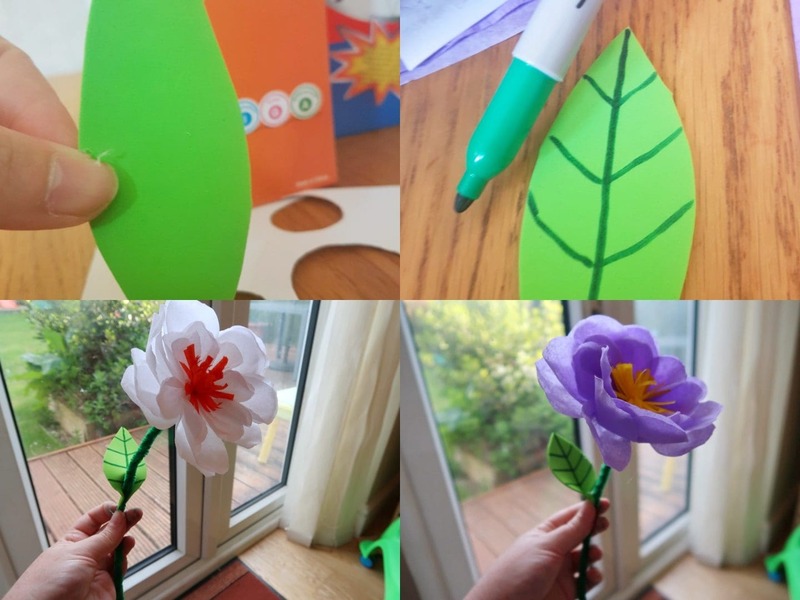 Now take the slightly smaller petal size and fold the ends of the petals upwards before sticking them in a smaller circle, around the hole left by the larger petals. You should then have an outer ring of larger petals and an inner ring of smaller petals. 5. 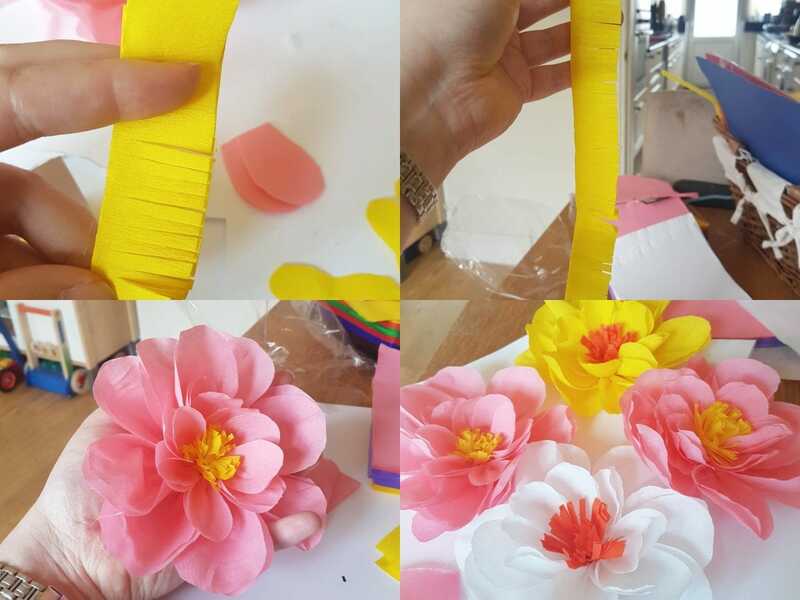 The final step in making the flower head is to cut a rectangle of crepe paper for the centre of the paper flowers. You should choose a different colour, one that compliments the petals. Fold the crepe and cut it so that in forms a fringe. Then, roll the crepe paper up so that it creates a central pom pom for the centre of each flower. You can then glue it into place in the centre of the card, in the middle of the two sets of petals. 1. Next, I made the stalks for each flower. I took 3 pipe-cleaners and plaited them, leaving the last 2 cm of each. This creates three ‘spokes’ that you can use to attach the flower heads. Again, a glue gun works best here but you could use any type of glue. 2. Secondly, I added some foam leaves to some of my flowers but this is optional. 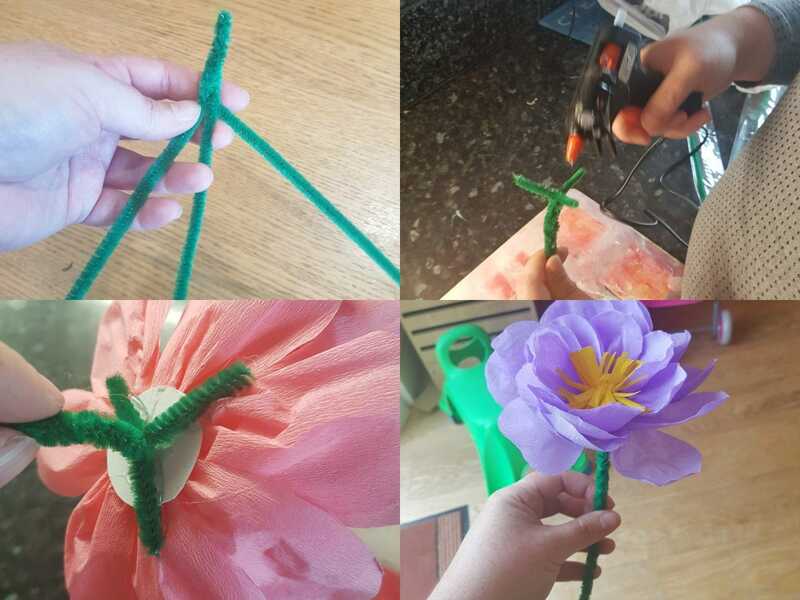 If you are using the flowers for young children it may be sensible to tape the bottom end of each stalk, as sometimes the pipe-cleaners have slightly sharp edges. 3.You could put the flowers in a paper or plastic cup as a vase, or you could secure them as a bouquet you can hold. To do this, simply secure by wrapping a pipe cleaner around the top and bottom of the stalks, creating a bunch of stalks that is easy to hold. And there you have it – a beautiful bunch of flowers that don’t need water and that will never wilt. 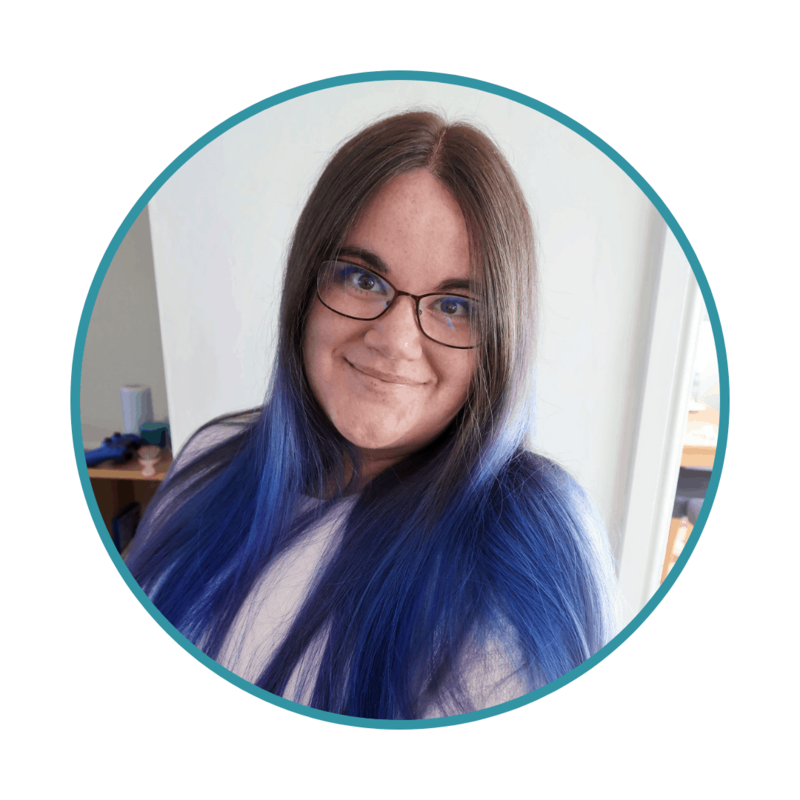 I used four different colours and made two of each, creating a bunch of eight for my bouquet. For more crafts, please check out our Crafts Section. Or you could try out this gorgeous Floral Wreath from Hi Baby Blog.